Discussion in 'Technology News' started by bssunilreddy, Mar 7, 2018. 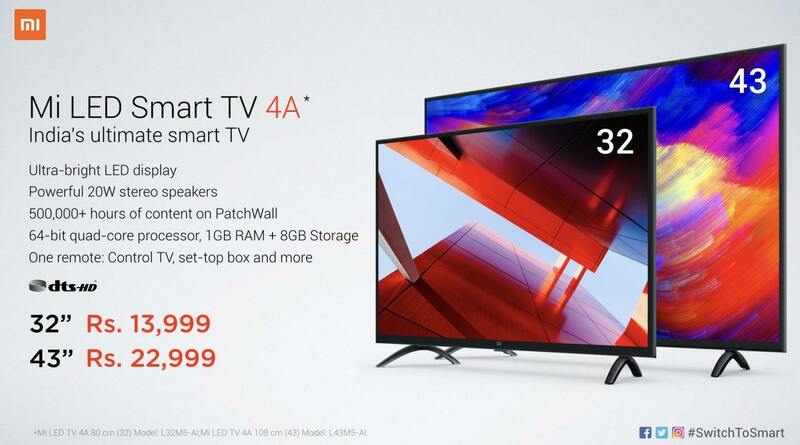 Xiaomi on Wednesday launched two new Mi TV models in India, making a lineup of televisions available in the market less than a month after the introduction of its first Mi TV model - the 55-inch Mi TV 4 - in the country. With the move, Xiaomi is now offering more options to consumers, giving them cheaper and smaller models to choose from. The Chinese electronics company launched the 43-inch Mi TV 4A in India, alongside the 32-inch Mi TV 4A. Both models are 'smart TVs', featuring Xiaomi's India-optimised and AI-powered PatchWall UI. The lineup is called the Mi LED Smart TV 4A in India. The Xiaomi Mi TV 4A's 32-inch model, launched in China in July, features a few differences in India. sports an HD (1366x768 pixels) display with a 178-degree viewing angle and a refresh rate of 60Hz. It is powered by a quad-core Amlogic SoC coupled with 1GB RAM, and 8GB of inbuilt storage. Connectivity options on the 32-inch Xiaomi Mi LED Smart TV 4A include Wi-Fi, three HDMI (including one ARC) ports, two USB 2.0 ports, one Ethernet port, one AV component port, and a 3.5mm headphone jack. It measures 733x478x180mm (including base). The 32-inch Mi LED Smart TV 4A supports DTS-HD, and bears two 10W speakers. It ships with the 11-button Mi Remote that can be used to control a set-top box apart from the television itself, using the Mi IR cable priced at Rs. 299. It also offers voice control features. The Xiaomi Mi TV 4A series was launched in China back in March last year, but the model launched in India has a few differences. The 43-inch model sports a full-HD (1920x1080 pixels) display with a 178-degree viewing angle and 60Hz refresh rate. It is powered by an Amlogic (four Cortex-A53 cores clocked up to 1.5GHz) processor that's coupled with the Mali-450 MP3 GPU. It bears 1GB of RAM, and 8GB of storage. Connectivity options on the 43-inch Xiaomi Mi LED Smart TV 4A include Wi-Fi, three HDMI (one ARC) ports, three USB 2.0 ports, one Ethernet port, one AV component port, one S/PDIF audio port, as well as a 3.5mm headphone jack port. It measures 970x613x214mm (including base), and weighs 7.43kg (7.37kg without base). Xiaomi is also touting the presence of DTS-HD, which will augment the audio experience of the television, apart from two 10W speakers. The audio been optimised for India, in terms of loudness. It ships with the 11-button Mi Remote that can be used to control a set-top box apart from the television itself, using the Mi IR cable priced at Rs. 299. It also offers voice control features. What about support for SD content in 43 inch model ? ABSOLUTELY AMAZING. For this price segment you won't find a better TV in the Indian market. Picture quality is superb, PatchWall Interface is cool. Sound quality is above average. Overall very happy and satisfied with Mi TV. Patchwall is another puke worthy UI like MIUI. They should've just used Android TV without any garbage modifications. cant we flash it liek we do it on mobile?? Someone at XDA developers will come with a solution soon. Let's start a request there. They haven't released any sources for their TVs. I read about this being discussed as an issue with Xiaomi. According to the Linux kernel license, Android and it's variants are legally bound to share their code. Which Xiaomi seems to be reluctant to, lately.